The famous Walking Street Pattaya – is known far beyond the borders of Thailand, therefore view from online webcams Pattaya Walking Street will be interested all those who would like to at least virtually look at what is happening on this street, as well as those who have already visited Pattaya and left there part of their soul. Broadcast from the two new webcams that are installed directly on Walkking Street, began recently, but they have successfully replaced the one camera, which worked before on FLB bar. I sure, new live webcams will be popular for those who at least once watched the city with the help of them. The first new live camera is installed at the entrance to one of the thematic institutions Walking Street, this street brought worldwide fame. We are talking about an institution Sweethearts A GOGO. The camera is mounted directly above the central part of the street Wolking street, so you can use it all happens on it pretty well see: the glittering signs of neighboring establishments, passing tourists and locals (although in most it is more a thai girls) and city transport Pattaya during daylight days. Depending on the speed of your Internet connection, broadcast from webcams Pattaya on Walking Street starts after 15-30 seconds after the page loads. And the broadcast will start automatically, press do not need anything. Like other Webcams Pattaya, new cameras also carry broadcast around the clock webcam Pattaya (with some exceptions). This is the main difference from the previously posted on the web page of the camera FLB bar, which had a limited operating mode: broadcast images began after 15-00 Moscow time, when approaching the sunset in Pattaya itself, ie, was made by the webcam only in the evening and at night, when the legendary pedestrian street of the city – Walking Street, on which the majority of the most famous nightlife Pattaya clubs, night bars, exotic shows, and A-Go Go, becomes a pedestrian and becomes one of the main epicenters of the night life of the resort. By the way, during his visit to Pattaya i am specially went FLB bar (the benefit is it is next to Club Insomnia) and noticed that the webcam, which hung over the entrance, do not exist. Those. I hope that maybe it will work a later, but many sites still write about the fact that this camera is just temporarily disabled. The second new Walking street live webcam is located at the entrance to Walking Street Guest House – a place where you can cheaply to stay right on the famous street for a very good for this location price (the central part Walking Street, next to the famous disco Lucifer) . For the price of less than 14 euros for two you get a large clean room, big bed, normal bathroom and free WiFi). Check availability can be placed using the window below the search form Web camera. 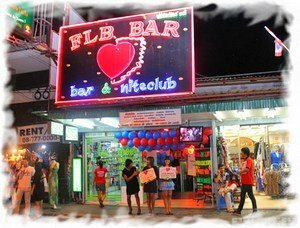 Unfortunately, the new live webcams in Thailand on the Walking Street do not convey a picture of a city street with a sound as previously existed webcam in the FLB Bar. However, if you have visited this street and Pattaya on it, you can easily imagine the music from nearby establishments, transport, sounds, etc. All that allows to further immerse themselves in the atmosphere of this unique resort. Have fun!